Memory was initially a difficult one for me to focus in on. The irony being that photographs themselves are so often our memory triggers. In the end it came down to the inherent fact that I am, and always have been, a collector. This made me question, when did the collecting instinct that I have first start? My grandmother, Nannan as we called her, had an wonderful eye for beautiful things. She and I both described ourselves as magpies, liking bright, shiny things. From when I was very little, if we visited her house, it was such a special treat for me alone to have a cup of tea and drink it from one of her precious Shelley china teacups, part of a set she was given as a wedding present in 1936. The pattern is called Apple Blossom, the style is the Regent shape, and the porcelain is so fine that if you hold it up to the light you can see through it. It made the best cup of tea. I think that was the beginning of my obsession. In the background of this photo you can see my china cabinet, where on the bottom shelf a very small selection of my Shelley pottery collection is displayed. It is bold, Art Deco at it’s finest and I love it! I still collect, and have many different kinds of collections, but it is a lot more difficult living in Texas than it was in London, England. My dining room is very dark so I pulled up the blinds completely to let in as much light as I could, and turned on the cabinet lighting, which is why there is a yellow/orange cast in the background. Due to the darker room, my ISO was set at 800, and my shutter speed was only 1/50 so I rested my elbows on the table to steady my hands. 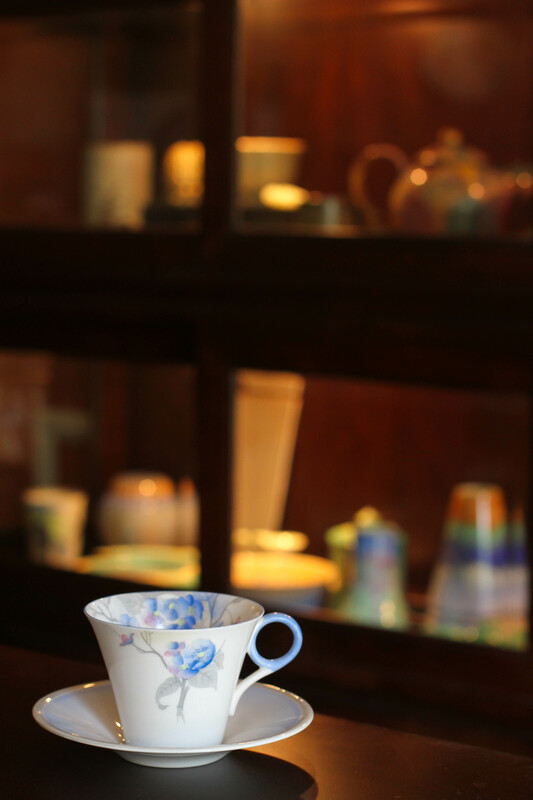 I set the aperture at f/4 because I wanted to show the items in the background, but I still wanted to blur them out to a certain extent so that the cup and saucer were the focus of the picture. Editing once again in Lightroom 4, I lightened the shot a little by increasing the exposure, I decreased the white highlights so the pattern on the cup stood out more, slightly increased the vibrance, clarity, and saturation. For the blues in the photo, I increased the blue saturation and decreased the blue luminance. Finally, I sharpened the shot, and smoothed out the luminance. Beautiful, huh? And a source of many memories for a whole lot of people. Guided trolley tours and walking tours are available in the summer, or you can venture in on your own any time of year on foot, bike or car. I wondered what y’all were going to do on memory! Alex, love the tea cup…so sweet and beautiful and I love the story behind it. 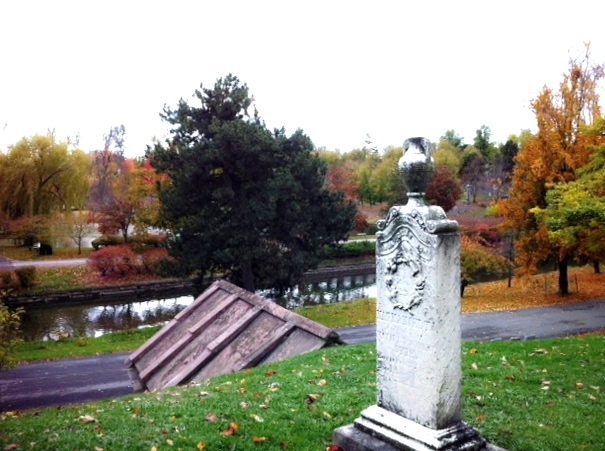 Bonnie you really captured beautiful site of a cemetery. Good job…looking forward to see tomorrow. The leaves are stunning in your photo Bonnie!!! Makes me miss Canada so much more when I see that. You did a great job on the grave marker…..it looks very regal the way you have it positioned. You have a great eye for what to include in a picture and what to leave out. Alex, you are a true artist. You make the simplest objects look interesting and noteworthy. That’s natural talent baby! Amazing photos!! Bonnie, love the colors! Alex, the teacup is gorgeous! I’m absolutely loving your pictures and reading your descriptions.